Brisk walking is good for health. Use the right shoes and follow certain do’s and don’ts. In order to remain fit and healthy one needs to exercise regularly and maintain a healthy diet. In India, 90% of the population do not follow any health and fitness regime or a healthy diet. India is not a sporting nation. Health and fitness come last our list of priorities of our daily routine. Most people leave early in the morning for office and come late in the evening, so there is the time constraint. Exercise and walks make you feel tired, thereby making you cut short some other daily routines. There is no time to exercise after the daily chores. EMS technology, used at ZYNK Fitness Studio, gives you fitness and health by just working out for 30 minutes, every week, in their fitness studio. Electro Muscle Stimulation (EMS) technology stimulates the muscles in the body just as in workouts. The movement of the muscles is called the contraction. The fitness achieved from exercise depends on the number of contractions of the muscles. The EMS technology used at Zink produces 3600 contractions in 30 minutes which is not achieved even by two hours of Gym exercise. In a normal gym routine, every time a contraction is done by the muscle the message is sent to the brain. Thus the process becomes tiring. In the EMS technology, every contraction produced by the electrode is effective as 10 contractions in a normal gym workout. When the information of one contraction is sent to the brain, the muscle has already done 10 contractions with the EMS. Therefore we feel relaxed while doing an EMS fitness routine. The Zynk fitness trainers say that during a normal gym routine some of the muscles do not get exercise. But in EMS training, 90% of the body muscles are activated. The person is made to wear a specially made jacket with EMS electrodes. The size of the jacket varies from person to person. The EMS used at Zynk fitness is wireless. This technology has been used by professional athletes like Usain Bolt, Karim Benzema, and many others. Athletes do EMS training for more strength, more endurance, more speed and more flexibility. EMS shot into prominence when YohanKots, a Soviet Scientist, revealed that EMS could boost strength by up to 40% in elite athletes. According to Vani Trivedi, of Zynk Fitness, “For 48hours after workout body in on a weight loss mode.” With a proper diet and EMS training, you can lose weight in 90 days. For those who suffer from neck and back pain due to continuous sitting jobs, EMS therapy is very effective. EMS technology used in rehabilitation and training for people under physiotherapy. EMS helps to tone the body and helps achieve the original weight and tone. It supports the regeneration of deep muscle fibres and connective tissues affected by pregnancy. In the gym, all areas are not covered. But with EMS 90% of the muscles are covered. Electrode works all over the body. EMS is very effective for skin. The skin glows after undergoing the training. As one gets older skin gets sagging, and it not toned and tight. Your skin tone improves with EMS training. Growth hormones are responsible for our looking younger. Celebrities do botox to look younger. By EMS training you can boost growth hormones well. It will keep you younger for longer. When you age, size of bone gets weaker and smaller. EMS does systematic work of bones and muscles and not joints. You feel oiling happened in every bone. Every bone feels fresh and light. Therefore your confidence increases. There is an overall improvement in health and fitness because of deep tissue strengthening, improvement in the cardiovascular system and improvement in blood circulation. There are over 1000 similar centres around the world, this is the first EMS fitness studio in India. You can workout without being tired. Even after having a long day’s works you feel rejuvenated after the Zynk fitness training. Besides if you come for the Zynk fitness session before going to the office, you can have a shower and look fresh. As there is negligible sweating you feel relaxed after the workout. The is no pain of exercise and you do ten times more of fitness training. The trainers at Zynk say that EMS works on the muscles and bones, and not on the joints. Injuries happen when there is overload on the joints. According to the Zynk fitness trainer, the EMS workouts produce long-lasting results using simpler workouts. Every year we take new year resolution to give up a bad habit or to begin a good one. This years theme for World Arthritis Day on October 12th was “It is in your hand, take action” to live life to the fullest. Most of the people with arthritis, whom I know, put in lots of efforts so that they can keep in pace with the demands of the world and live life like normal human being. The excruciating pain, fatigue and disability are some of the hindrance for a arthritis patient. Some succumb to the condition, while other turn all the obstacles into opportunity. If those suffering from arthritis take some new year resolutions to improve their lifestyle then they too can live their life to the fullest. Arthritis is becoming quite common in Delhi, especially after the yearly outbreaks of Chikungunya virus. People experience joint pain and difficulty to walk even a few months after they had Chikkungunya. Now a days, if you stagger, people inquire if you were suffering from Chikkungunya. There is lot of commonality between Chikkungunya and Arthritis pain, and in some cases Arthritis pain and deformation are triggered after a Chikungunya attack. People of any age can get arthritis, but if you take some precautions you can avoid worsening of the condition. If you chart out a healthy lifestyle pattern for yourself, some of the damages get repaired and you can enjoy a normal lifestyle. Most of the arthritis patients I meet have come up with their own creative methods to mitigate the pain. Some rely on allopathic medicines, others on Ayurveda and some on herbal remedies. They now know which food causes pain and which one relieves pain. Preferably follow a vegetarian diet, which is easier to digest. Some fishes are good, but egg and meat are better not to be consumed regularly. Have lots of water especially on an empty stomach. And sometimes it is good to fast. Most religions have fasting period in the religious calendar. If you follow the fasting with discipline that will help relieve the pain. If you have never fasted in your life, then consult a doctor before fasting. Arthritis is an auto-immune disease where the body cells are attacking one another. Experts say that during fasting period the body cells get time to relax and repair. Of all the medicines, walking is the best prescription for arthritis. Some say that they walk instead of driving or riding a scooter. But that is not enough. Every day you must walk atleast 20 minutes, as part of fitness regime. Consult your doctor to find out how much time is recommended for your walking and exercise. Also find out if you are permitted to Jog. Walking is the best medicine for arthritis. If you walk atleast 5 days a week, you can maintain a healthy lifestyle. When you feel pain, doing exercise will mitigate the pain. Mental and spiritual well being is a crucial aspect of arthritis. The condition aggravates when one is mentally disturbed. Hence you should spend atleast an hour every day for Meditation. You must find the inner peace and the soul connect. Many patients with RA positive,and some even chronically bed ridden, claim to have been miraculously cured because of their belief in God. Some doctors recommend meditation for an hour daily. Being at peace with oneself and avoiding stress helps in coping with arthritis. When professional sportsmen hang their boot at 40, Daisy Victor began participating in athletic events when she was just a few days shy of her 50th birthday. “I am only 83 years old,” says Daisy who runs and exercises every day in the ground near her house in Madhavaram, Chennai, and she also hits the Gym for Fitness twice a week. She also practices long jump at the Nehru stadium every week. In National and International Veterans athletics Meets so far she has won 377 medals from 104 meets. She won 46 golds from 22 internationals meets and 96 golds from 33 national events. Daisy, a former employee of BSNL in Chennai, and a mother of 6 children took up athletics seriously in 1981 when she participated in the World Veterans Athletics Meet in Christchurch, Newzeland. Her biggest moment was when on her return from the event, she was introduced to Prime Minister Indira Gandhi by the Flying Sikh Milkha Singh. Daisy’s indomitable spirit has inspired the youngsters, including her 13 grandchildren who are proud of their grandmother’s achievements. During summer vacations, boys and girls come to her to get coached for athletics. Schools and Colleges invite her to inspire the youth to make sports and exercise a part of their lifestyle. “All my achievements is because of the Grace of God. He gave me the strength and talent to run,” says Daisy who wakes up at 5 in the morning and begins the day with prayer along with her husband Victor Sundararaj. “Though women are physically active throughout the day with household activities, they need to do exercise every day for their necks, hands, legs, etc,” says Daisy who began running and winning as a school girl in Bellary. It was her father, who was a sportsman, encouraged her to participate in athletic events. When asked what the elderly must do to be physically fit she said “They must do physical exercise and walk at least 15 minutes every day. The should not be walking leisurely but brisk walk”. 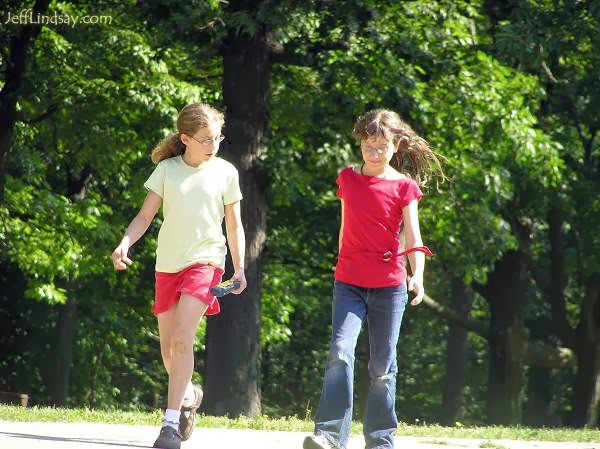 Read this post to know more about the advantages of brisk walking. She says people should follow a strict diet and a strict routine to remain healthy and fit. She takes very little rice, consumes a lot of vegetables and avoids snacks and tea as much a possible. When most people struggle to walk a few miles at this age, Daisy travels every day by bus and she talks to people, inspiring them with her own testimony of determination and complete faith in God. Until a decade back,when transportation was costly and very few owned a vehicle, we used to walk a lot in India. As the years go bye the daily walking hours keep decreasing. My family was enthusiastic of walking. I thought why not make a comparative study of the walking habit of four generation – grandfather, father, myself and now kids spend walking. Read this post to find more about how walking boost memory. Grandfather: An accountant by profession, before the independence of India, he used to walk hundreds of miles to meet his clients. He walked day and night, barefoot, and come back home sometimes in the wee hours of morning. Diet: Rice was his staple food – breakfast of rice flour dishes; rice and curry for lunch and dinner. Every morning, at 4 AM, before starting his work, he had egg-milk (piping hot milk poured into a steel tumbler containing raw whipped egg). As a small child one day I insisted on having the same concoction and the same quantity as grandpa was drinking. Guess what happened – I couldn’t drink even one sip and that disgusting smell of the raw egg persists in my memory!. Grandma says that this ‘Magic Egg’ concoction was the secret of his good health. Health status: Grandpa was a thorough professional of those days with a high social status. He was active in many social circles until one day when he died of heart attack at the age of 75. Father: A post-independent product, the maximum my father walked was from his home to school, an aggregate of 10 kms per day. By the time he grew up there were buses and cycles. When he started working he brought a cycle and now he has a car. Diet: A strict non-vegetarian, he has only home made food. Ask him to control his weight or to change his food habit according to age – my kids don’t have to be coaxed so much to eat vegetables. Health status: Now a days he is a cardiac patient and so he is supposedly on a cholesterol-control diet. Myself: On a average I used to walk for 6 kms/days during my college days – home to bus stand / bus stop to college. Sometimes we friends used to walk for 3 kms, from the college to a Bus Junction. Now I have my private vehicle; the public transportation also reaches upto my door steps. If I think of walking from the metro station to home, there are many hurdles – pollution, heavy traffic,…. Diet: Though I insist on having home made food; everyday I have a grab of the Junk food due to uncontrollable factors – office party, going out with family, overtime in office. Blame it on the lifestyle! The lifestyle promotes the Junk food culture! Health status:Would have been an easy target for Obesity, diabetes, arthritis, spondylitis,….. had it not been for my regular walks, restricted diet and exercise. Kids: They run, jump, jog, swing, leap, and yes walk also! Not the kind of walk that will enhance good health. They walk in schools, in malls, on the market lanes; they never walk fast consistently for 10 minutes. The residence are so small and packed with furniture that children don’t get a chance to walk inside home. Some also have skateboards to move around in the house. Diet: Its hard to draw a clear distinction on the kind of diet to follow for kids – nutritional diet/freshly cooked food diet/Junk food. Mothers have to decide very early in life about the kids diet. No matter how strict a mother is about home-made food and nutritional diet, a child on a average has atleast 100g of processed chips daily. In addition jam, sauce, biscuits, cakes,…….are all processed food. Health status: Obesity is common, some kids are on weight reduction diet.We walk when the circumstances demand! 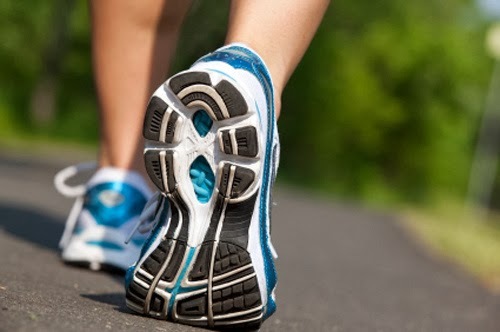 There is no compelling factor, today, to wake up early in the morning for walk; until one becomes a victim of lifestyle diseases.Walking half an hour a day can keep lifestyle diseases away! When we are yet to get used to the habit of walking for health, experts say that we should wear shoes for walking. Shoes is an alien concept, in India were we don’t have the tradition of covering the feet completely. Our forefathers used to walk barefoot hundreds of mile for a livelihood ; I used to walk to college in stilettos. So one fine day when someone says that walking shoes are essential for walking, sound irrational! Read this post to know about the fitness regime of the elderly. I always ignored the advice to wear shoes for walking. Once I brought a canvas shoes, within a few days gave it in charity. There is nothing more comfortable than the lightweight, rubber slippers in which the foot can move freely. I stuck to my theory for over a decade, until I saw many elderly women wear sports shoes for walk. Whether in sarees or salwar/kameez most of the walkers now walk in sport shoes. Though not fully convinced that there will be any visible change, I decided to go with the trend – I brought an athletic shoe for walking. I used to cover 10 laps in an hour; wearing shoes I can cover 15 lapse. Which means 50% increase in performance. While walking in a slipper the toes have the additional job of holding the straps in place. This decreases the speed of walking. Walking shoes are generally designed to be flexible to the ball of the foot; when you walk the weight of the body rolls from the heel, to the ball of foot and finally to the toes. A good walking shoe will help reduce the pressure borne by the foot. A good shoe helps create natural body posture. Buy shoes that are flexible in the toe so that you can bend and twist the toe part while walking. In the slippers the feet is covered with dust and they are prone to get injured. A shoe protects the feet from external damage. The shoe should be lightweight and flexible. There should be enough cushioning under the ball of the foot. Buy a shoe of good quality; use your instinct rather than the salesman’s opinion. Take a trial, of both the shoe, before buying. A scientific study says that if you want to lose weight make friendship with lean people. The attitude of my friends towards walking proves the finding to be true. Read this post to know about the walking habits of four generations of a family. During friendly chats, when I tell my friends about the refreshing morning walks, they complain that I was too mean to not call them for company. So one of them decided to come for the walk at 7:00 in the morning. However I was awaken by a mobile message at 3:00 AM; which read ‘I won’t come for walk, as I slept very late yesterday‘. Another friend decided that her children also require some exercise, so she accompanied me on morning walks with two teenage son and a little daughter. While we walked, the kids played badminton in the park. As the children were playing, our concentration was on the security of the kids; so we walked less and watched the kids more. In order to cajole the children to come everyday for walks, we used to have a small party of cookies and hot coffee after the walk and game section. Walking with friends strengthens friendship but fails to achieve the ultimate aim of achieving physical fitness. So on weekday I walk alone and on on the longer weekend walks friends are also invited.